Sam, Rambo Steve and Peel agreed to (sort of) an on-the-job interview and photo shoot at their place of business, Installations Antiques in the Heights, Houston, Texas. It's worth a visit to Installations Antiques just to meet these cats. They have marvelous taste in antiques, ranging from European primitives to American mid-twentieth-century modern and can advise you on the best chairs or tables in the house. Sam, behind (well, on top of) the counter. Rambo Steve: "Sir, the cat box is straight ahead." Sam: "The antiques business is a purrrfect fit, given my talent set." 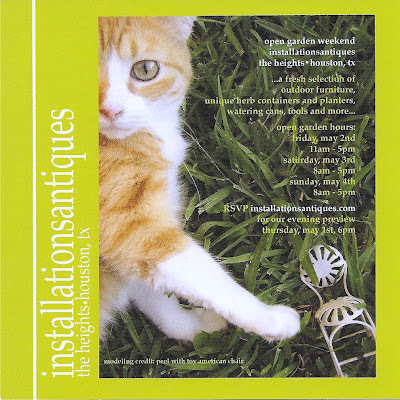 The above advertisement was used with permission from Becki van der Oord of Installations Antiques. 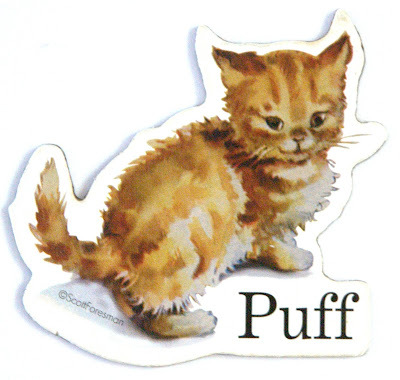 Don't you think Peel looks like Puff on my magnet above?